We are just days away from Christmas and I still have so much to doooo! At least I finished my cards today and now I just need to get them in the mail. Hmmm...I wonder if Australia Post will deliver in time for Christmas? Aside from all the usual countdown to having everything done in time, I have been meaning to do another blog entry to kind of 'gather everything together'. I'll start with the Studio's Annual Christmas Carol Blog Hop (which you'll find below) - I apologise for the blocked download link - I have a new link now, so please try downloading again if you had trouble previously. I love all the comments that people leave - it's so rewarding to know that your work is appreciated. Thank you! The Studio's Advent Calendar has a new piece each day through Christmas Eve. Don't forget to check in each day to nab yours. These have been created around the same palette, so you will be able to mix and match pieces from each minikit. Enjoy!! 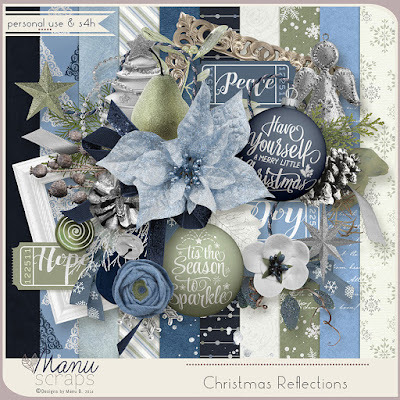 "Christmas Reflections" is a 'more-than-a-mini' that I did in conjunction with my wonderful friend, Manu, of Manu Scraps. We both called our mini's "Christmas Reflections" and we used the same palette. When you purchase both you'll be able to mix and match. We also have a BONUS OFFER. 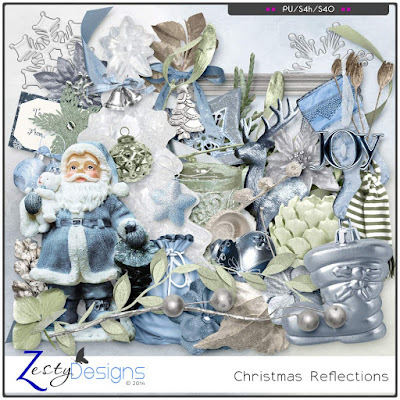 Purchase this kit AND Christmas Reflections by Manu Scraps to get these exclusive clusters FREE! I have three new paper packs releasing today. They will be 30% off for a limited time. 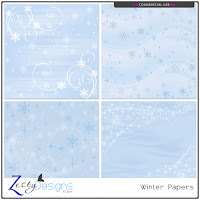 RETIRING "Winter's Frost - Co-ordinated Collection"
This collection will be 70% off until the end of the month - then it will disappear into the vault. If you don't have this collection, now is the time to pick it up at the lowest possible price. And lastly, just a reminder - The December Start-Up Challenge has another little freebie waiting for you! From my house to yours...Have a wonderful Christmas! ANNUAL CHRISTMAS CAROL BLOG HOP IS HERE! Welcome to the Studio’s Annual Christmas Carol Blog Hop. Every year the Studio Designers gather together to “sing Christmas Carols” to all of our members, customers, fans & friends. It’s a way for us all to say Merry Christmas and a big Thank You for being so supportive. 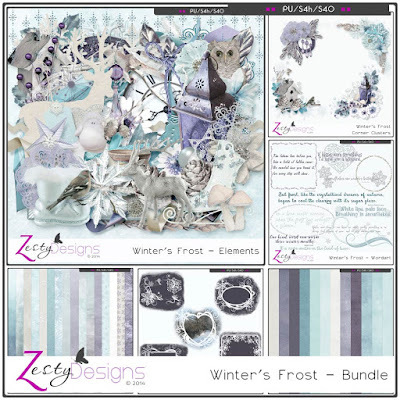 Each participating Designer has chosen a special Christmas Carol just for you and designed a cute mini freebie around it. So put on your dancing shoes & singing voices and come caroling with us. If you want your friends to have a copy, send them to our blogs to get their own free copy. Please note: the download link has now expired. This kit is now available in my store here.